Welcome as we go 2 for 2 for the 20th time this season. Here is everything you need to know about this coming weeks pitching matchups and our 2 choices for pitchers that have two favorable starts on the schedule. These are the pitchers that you may consider adding to your weekly roster or ones that you may want to pick up and stream a start. If you are new to this game or unfamiliar with the strategy of streaming starting pitchers, click here for a refresher and some great links you can use. Also included in this article are some SP notes to help you decide on next weeks roster, followed by one streaming starter for each day of the week that the stat geeks over at the Muthaship think will be a viable option for your fantasy roster in the coming days. And if all this wasn’t enough, it’s followed by a great recipe. This time it’s Porchetta. Cardinals right-hander Justin Masterson won after yielding just three hits and no walks with three strikeouts across seven shutout innings Wednesday against the Marlins.The right-hander faced one batter over the minimum and threw just 57 pitches in his first five innings. The gem came as a big surprise, considering Masterson had entered the game with a 1-3 record and a 10.04 ERA in his previous seven starts. Owners in deeper formats should note that Masterson carries a 4.14 FIP and a 8.1 K/9 rate in 113 innings, but his 4.9 BB/9 rate should keep him on waivers in standard leagues for now. Owners in deep formats in need of pitching stats down the stretch can give Masterson a try on Aug. 18 against the light-hitting Reds in St. Louis. Justin Masterson turned in a fantastic start against the Marlins Wednesday. Masterson tossed seven scoreless innings of work, giving up just three hits. He struck out three and did not issue any walks. Masterson faced the minimum of three batters in all but three innings. He never allowed a running to advance to second base during the start. With the win, Masterson improved to 6-7 on the year. He’ll take on the Reds in his next start. Alfredo Simon suffered his eighth loss after relenting seven runs (five earned) over five innings on Thursday against the Rockies. Simon had a scoreless first, but the Rockies scored in each of his next four innings. The right-hander allowed 10 hits, walked one, and struck out two in an evening he’d like to forget. Simon has otherwise been dominant this season, as he still has a 3.28 ERA, a 1.18 WHIP, and a 92/41 K/BB ratio. He’ll try to rebound against the Cardinals in St. Louis on Tuesday. Reds right-hander Alfredo Simon lost after giving up seven runs (five earned) on 10 hits and a walk with two strikeouts in five innings Thursday against the Rockies.Simon fell victim to the hitter-friendly effects of Coors Field and is now 12-8 with a 3.28 ERA as a result. Although those marks are certainly respectable, Simon has not been sharp lately with a 0-5 record and a 5.46 ERA in his past six starts. It would be wise to avoid Simon on Aug. 24 against the Braves at Great American Ball Park. The struggles continued for Reds pitcher Alfredo Simon Thursday night against the Rockies at Coors Field, dropping to 12-8 on the season. The right-hander was shelled for seven runs – five earned – on 10 hits and one walk while striking out two over five innings of a 7-3 defeat. Simon started the season 12-3 with a 2.70 ERA, but over his last six starts, he’s gone 0-5 with a 3.51 ERA. He will look to get back on track Tuesday at St. Louis. At the time the Baltimore Orioles demoted him to Triple-A Norfolk, Miguel Gonzalez was expected to rejoin their rotation once eligible for promotion, which occurs Tuesday. It is unclear whether the team will stick with six starters after then. Scott Carroll (blister), who had his Aug. 12 start skipped, was expected to rejoin the Chicago White Sox’s rotation on Aug. 15, though he could be held back until as late as Tuesday. If Carroll needs to be pushed back, Chris Sale would move up to Aug. 15 and lose his two-start Week 20. The Cleveland Indians will need a fifth starter no later than Saturday, with Danny Salazar the most logical choice for that assignment. The Detroit Tigers’ rotation is somewhat in flux due to Justin Verlander’s (shoulder) uncertain status, but they can push his spot back as late as Saturday’s doubleheader, at which time they’ll need two fill-ins. Buck Farmer, who started on Aug. 13, could be a candidate to pitch one of those games. Ricky Nolasco (elbow) was scheduled to rejoin the Minnesota Twins for an Aug. 15 start, but manager Ron Gardenhire said that the team will not use a six-man rotation. It would make sense for them to, at least through Week 20, as the team will need a spot starter for Saturday’s doubleheader. Roenis Elias is scheduled to rejoin the Seattle Mariners’ rotation on Monday, but it is unclear whether the team would then use its Thursday off day to push back his second start of Week 20. Hisashi Iwakuma would draw a second start if Elias’ next turn is pushed back to Aug. 25 or 26. The Chicago Cubs recalled Dan Straily from Triple-A Iowa to start Aug. 16, but it is unclear whether it’s a mere spot start, whether the team will go with a six-man rotation or whether Straily might replace one of the team’s current starting five. Homer Bailey (elbow, neck) is expected to be placed on the DL by the Cincinnati Reds, though as of publishing time he hadn’t yet been. The team needed someone to fill his spot on Aug. 16, and if it wasn’t Bailey, Dylan Axelrod and Scott Diamond were two candidates (though neither was on their 40-man roster), while Daniel Corcino, David Holmberg and Chien-Ming Wang were less likely due to being on fewer than four days’ rest. Any could get a start the next time Bailey’s rotation spot arrives during Week 20, however, which is Thursday. Hyun-Jin Ryu (gluteus) is questionable for his scheduled Tuesday start, and manager Don Mattingly told the Los Angeles Dodgers’ official website that he expects the left-hander to miss that turn. The team could simply hold Ryu back until as late as Saturday — Monday’s off day affords them that luxury — or they could give Kevin Correia a turn in Ryu’s place sometime during the week. The Miami Marlins, who will activate Henderson Alvarez (shoulder) on Aug. 16, have no plans to stick with a six-man rotation, and can go with as few as four starters in Week 20 due to Monday and Thursday off days. Jarred Cosart and Brad Penny appear the two most likely pitchers to be skipped this week. Kyle Lohse (ankle) is questionable for his scheduled Tuesday start. If he’s unable to go, the Milwaukee Brewers could merely skip his turn thanks to Monday and Thursday off days and slot him in anytime before Aug. 26 (Tuesday of Week 21). Gerrit Cole (lat) is scheduled for an Aug. 16 rehabilitation start for Triple-A Indianapolis, and if all goes well, he could rejoin the Pittsburgh Pirates’ rotation sometime during their weekend series at Milwaukee. It’s unclear whom he’d replace, but the three Pirates pitchers scheduled for that series are the most likely candidates. Kyle Hendricks (@NYM, Monday): He’s riding a streak of five consecutive quality starts, and is a control specialist facing a New York Mets team that has batted just .223/.282/.321 (29th-ranked .267 wOBA) and struck out 3.3 times as often as it has walked (25th) since the All-Star break. Tsuyoshi Wada (SF, Tuesday): Each of his past three starts at Wrigley Field was a quality start, and he has a 3.80 ERA, 1.10 WHIP and 21.9 percent strikeout rate in four games there thus far. The San Francisco Giants, meanwhile, have the majors’ fifth-worst wOBA since the All-Star break (.286, behind .244/.304/.340 rates). Kevin Gausman (@CHC, Sunday): He has been productive in his road games thus far, going 3-for-5 in quality starts with a 3.21 ERA, and he’s a command specialist facing a Chicago Cubs team that has struck out 3.5 times as often as it has walked since the All-Star break (26th). Matt Shoemaker (@BOS, Wednesday): The Boston Red Sox have batted just .224/.275/.341 against right-handed pitchers (29th-ranked .268 wOBA) since the All-Star break, which offers one explanation for his three perfect relief innings, including four strikeouts, against them on Aug. 9. Josh Collmenter (SD, Friday): Five of his past seven starts at Chase Field have been quality starts, and he has a 3.20 ERA and 1.03 WHIP there overall this season. Collmenter has also already defeated the San Diego Padres this season, tossing 5 1/3 innings of one-run ball for a “W” on June 28. Rubby De La Rosa (LAA, Thursday): On a relatively poor day for streaming choices, De La Rosa stands out in a rematch of his Aug. 10 game (7 IP, 5 H, 1 ER, 8 K’s). At least the Los Angeles Angels are mere .225/.290/.345 hitters (28th-ranked .277 wOBA) against right-handed pitchers since the All-Star break. Odrisamer Despaigne (@ARI, Saturday): He already has one win versus the Arizona Diamondbacks this season (6 2/3 IP, 5 H, 1 ER, for a win on June 29), and they as a team have struggled mightily against right-handed pitching since the All-Star break, batting .238/.287/.357 (25th-ranked .280 wOBA). 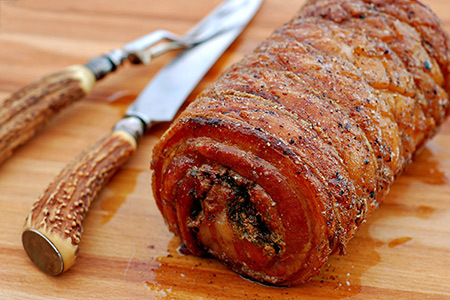 The traditional Italian porchetta (pronounced por-KET-a) is made of a deboned whole hog that is stuffed with garlic and herbs then rolled and roasted on a spit over wood coals. 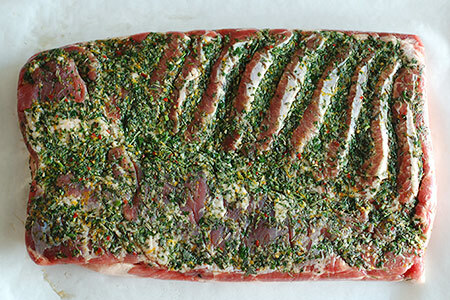 An American adaptation was to wrap pork belly around the pork loin. This was easier in years past because one could simply have their butcher leave the loin attached to the belly. That would be a tall order nowadays, so this new adaptation is made by simply using only the belly. It’s far less laborious to prepare, but the results are still incredible. 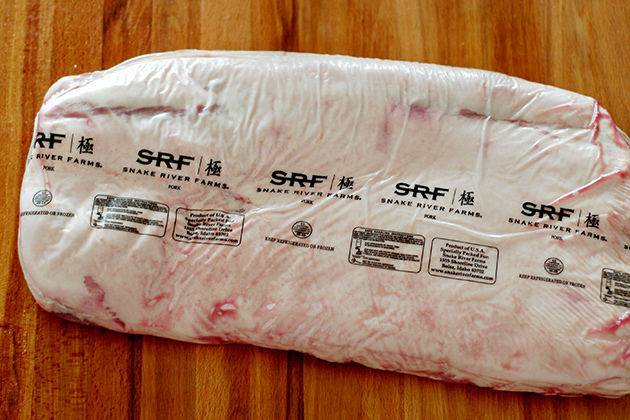 With the pork belly skin/fat-side-up on a cutting board, cut slits 1/3″ deep and 3/4″ apart in a crosshatched pattern. 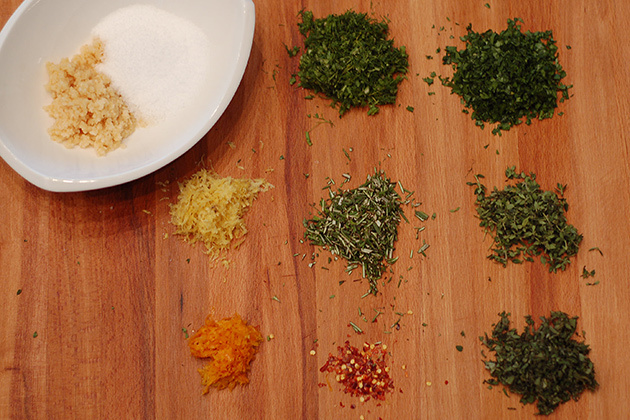 Rub two tablespoons of the salt thoroughly into the skin/fat, then flip over. Cut 12 pieces of butcher’s twine 18″ long. Unwrap the belly and roll in a jelly roll fashion and tie about every inch with the twine. 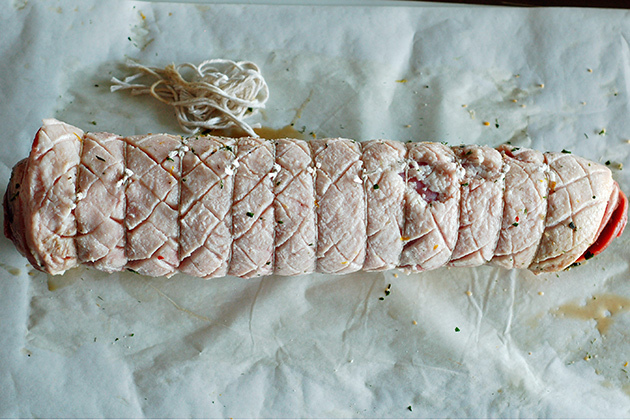 Cut the porchetta into slices about 1/2″ thick, serve and enjoy! 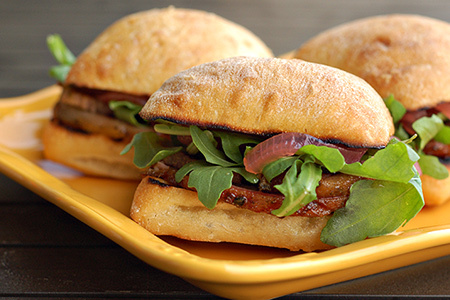 I served mine on a toasted ciabatta roll, topped with arugula and pickled red onion.